AIB boss David Duffy said this week the bank would pull out of a process aimed at reaching a solution for all of the residents, and try and reach deals with just its own customers. DESPITE SOME POSITIVES, the various bank CEOs’ answers on how they’re working with former Priory Hall residents have prompted huge concern amongst the group, a spokesperson has said. 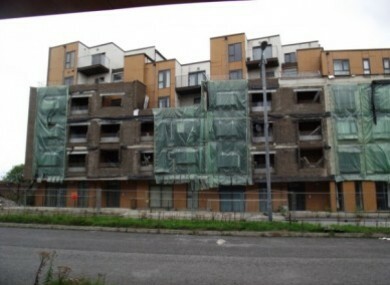 Called before the Oireachtas Finance Committee to address the country’s wider mortgage crisis, the heads of Bank of Ireland, AIB, Ulster Bank and Permanent TSB were also pressed on their response to the deadlock over the abandoned Donaghmede complex. There was a positive reception amongst the Committee members to AIB CEO David Duffy’s response that the lender wanted to put a “long-term permanent solution in place” for its 18 mortgage holders in Priory Hall, and to Duffy’s commitment that the bank would begin engaging with them all in a matter of weeks. Whilst welcoming AIB’s announcement, spokesperson for the residents Graham Usher told TheJournal.ie that there was also concern amongst the group over Duffy’s confirmation that the bank was stepping outside of the mediation process set up to reach a solution for all residents. Ulster Bank CEO Jim Brown’s response to the Committee that they were working through the problem with each of their 12 Priory Hall mortgage-holders on a “case by case basis” underlined the concern that banks are now moving outside of the process. Brown repeated several times that each case would be reviewed individually, and Usher said this had prompted “massive worry” among some residents. To be honest with you, people are quite panicked by it. Usher repeated the residents’ call for a meeting with Environment Minister Phil Hogan, who said again this week that he couldn’t get involved for fear of affecting the resolution of the case. It’s nearly two years since 256 residents were evacuated from the complex due to fire safety concerns. Dublin City Council has been housing the families in temporary homes since then. There is something unique about [Priory Hall] and therefore we need to have a level of empathy and sympathy which we will do. Bank of Ireland’s Richie Boucher told the Committee the bank was open to “a range of solutions”, and after questioning said he would look at what AIB had offered. Explainer: What is happening in Priory Hall? Email “Bankers' answers on Priory Hall prompt "massive worry" among residents”. Feedback on “Bankers' answers on Priory Hall prompt "massive worry" among residents”.